Institute manager Kevin Deery has released three players from his first team. 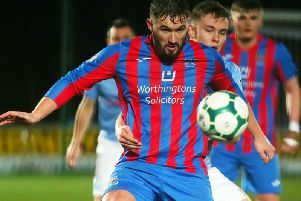 Duo Gareth McFadden and Ryan Doherty have ended their loan spell from Derry City and Deery has decided against renewing it, while winger Caolan Cooley has also been let go. “We let three players go and I would like to thank Gareth, Ryan and Caolan for their contribution throughout the season,” he said. “The two Derry lads’ loan spell was till January and we just felt that we couldn’t give them enough game time, so they’ll go and speak to Kenny (Shiels) and see what’s the best move for them now and young Caolan will go back and see what his best options are, but like the other two guys, I couldn’t offer him game time. “We have Kyle Friel Curran to come in, he’s another attacking player, who if he comes into our side in a few weeks’ time people can’t feel hard done by, because he showed good wee flashes of quality in training and we need to get him up to speed. Deery concedes he’s happy his side has a free weekend and admits he’ll take stock during the break. “My gut feeling is a break will do us good,” he said. “We have been pretty regimental in what we have been doing for the last six or seven weeks, so I think something to freshen it up this week will probably be on the cards. Yes, it might not change results, but at least it will give us a wee bit of a boost. “I told the boys after the defeat on Saturday that we have to go away and see what we have to do to improve ourselves and I’m the same. “I too have to go away and look and see what can I do better; do we need another gym session or do we need to do three pitch sessions? - wee stupid questions like that. “At the minute you can see our confidence is down a wee bit and confidence in football is massive. We tried to address the situation at training last Thursday night in the 11 v 11 game but even there we were a wee bit edgy.